Apologies for the downtime over the last few days - we hit our traffic limit for the month on the 28th and so the website wasn't able to be accessed until the start of the new month (Today). There were more images (and with higher file sizes) added to the Gallery last month, and the Wiki was reloaded with the newest software, which was no doubt what pushed us over the line. I'm hopeful it won't happen again this month. We're coming close to our bandwidth limit again guys. If you get a white screen with an error between now and 1 July, that's the reason. While increased traffic has played a part, I think I have identified another back-end issue that is being a bit of a data hog, and have a workaround in mind. Sorry for the downtime at the end of the month again. I think we were down over the weekend and on Monday. I've put a few things in place to hopefully cut back on our resource usage. These won't have any impact on your usage of the site as they affect back-end processes. Iif things don't improve our next move is to reduce the size of the Gallery. This would be achieved by identifying individual photos that have a larger than necessary size (such as a 2MB photo when a scaled down version looks just as good), and removing the photos that 'aren't that good'. I'll post again later in the month to let you know how things are looking. My apologies for the significant amount of July that the website was displaying the 'bandwidth exceeded' message. We're having some back-end issues with one part of the site. I strongly suspect it's the Gallery, which we have taken offline for the moment to investigate the issue. The site will continue to have the Gallery, but there's a good chance we will be replacing the software it runs on with something a little more reliable. I'll keep you updated, and if you're not following us on Twitter or Facebook, I strongly encourage you to do so (the links are up the very top of the page above the ACT Bus Forum logo) as these are the ways we will communicate with you in situations such as the 'Bandwidth Exceeded' one. Thanks to Buzz and team for persevering and finding the cause of the problem! Found out last night that Bus Australia had a problem with it's wiki too causing the site to not be available, possibly exceeding bandwidth also, they have since shut their wiki down permanently i'm lead to believe. I couldn't get in to ACT Bus on Sunday night, but I suspect that was caused by a TransACT problem....some other sites were troublesome also. I get email alerts whenever the site goes offline for any reason, and didn't receive any on Sunday evening. Some improvements for mobile users - the wiki and forum now autodetect mobile devices and switch to a mobile-friendly theme. The forum version is currently on trial, and I'd appreciate any feedback on how you find it. This now means that the website, forum and wiki have mobile versions. The Gallery will not have a mobile version at this time due to conflicts with the tagging functionality. You can also access our forum via the Tapatalk app, which can be downloaded free of charge from your app store. Feedback: maybe a 'last post' section at the end of the topic bar? Seconded. Or at least the green bus symbol showing if there are unread posts since last visit. Thanks guys, I'll see what can be done. I'm not too sold on the mobile forum skin so if people prefer the standard version I'm happy to revert to that. 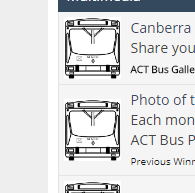 Is it just my iPad or is the forum part on the home page of ACT bus not showing? Not just you - thanks for pointing it out. I'll take a look over the weekend and see if I can fix it. Edit: Seems to be an issue on the forum side - the feed that populates that box on the website is not functioning. I've removed the box from the website homepage for now until I can fix it. Yep, also in favour - it gets annoying changing from the mobile to the standard version all the time! Recently, I've noticed a new member roaming through the threads of the forum. His name is ACT Bus forum and rather likes advertising on everywhere he posts. Is this just an error on my iPad or is everyone else having this 'advertising member' showing up on random threads? Apologies for the downtime today, and the generic error message. Both of these have been sorted. A couple of minor changes - spotting threads (AOA, what bus did you get?) have now been shifted over to the Games section. Apologies for the downtime on the forum lately. Not too sure exactly what's causing it, but I'm looking into it. If you do come across the error message during a weekday, the forum will generally come back online that evening. Apologies for the forum downtime (and the ever informative white screen of death) over the last day or so. Let me know if you encounter any issues while using the forum. Tapatalk and the forum software have been updated to the latest versions. I see the forum has had an upgrade. May take a little while getting use to the new format though. Has anything altered or is it the same just with a different look? The new look also scales to the size of your screen, so phone users in particular should have an improved experience. Oh that's good, no more of posts with multiple photos on one line being pushed around. Hooray. This new update seems to have bugged out a lot of the photos that had been uploaded over the past 2 years. I know things like that tend to expire, but it usually shows something to say that that has happened, but I was looking around some recent posts last night, and many with recent photos just have multiple paragraph spaces now. Now that is more like it! Nice update. Thanks for the feedback Sylvan, we're trying to roll out some minor updates around the place so expect a few teething issues for a week or so whilst we get everything working. And they change colour to the ACTION livery when there's something unread, that's awesome! Love it! Did something change recently, cause I could've sworn i had more than 1 of those yellow squares below my avatar a few days ago? What do the different yellow ones indicate anyway, cause I've noticed a few other members have 2 or three? Also, still love the Renault fronts for the read/unread indicators, but have you possibly considered doing a bunch for each section of the board? Like having the Renault's for the old bus related boards, CNG or Euro front for modern, Bustech for the more active boards, and a LR and plane front or whatever for the others. Any chances of something along those lines? Yes, I changed the squares recently. It basically represents your seniority on the forum. Once you go over 1000 posts, you'll get more squares. As for the icons - no. The forum software only allows for "read" and "un read" icons. Hi all, we've upgraded to the newest version of the forum software. If you spot any bugs around the place, please let me know and I'll do what I can to sort them. Tapatalk will be unavailable for now unfortunately. While the latest version of Tapatalk is apparently compatible with the new software, it definitely did not work when I installed it. I'll need some more time and testing to sort that out. Avatars have also blanked out, so you may need to re-add those. Most of the improvements are to the back-end, but you'll see some new features around, including two-factor login authentication, likes, and notifications. At least for me, I set the time zone to Sydney, but it appears to be running 11 hours ahead which is rather off putting. Time display problem should now be fixed. If your time is still wrong, set your account to "Forum Default". If that still doesn't work, send me a message. Probably not something you can change at your end, but selecting the correct word/spelling suggestion on my preferred phone keyboard no longer works. It works fine on other sites. The stock keyboard on my phone does work for the forum though. Accessing other areas of the site with click-able links aren't possible anymore. There was always a button to go to the gallery, wiki, actbus site etc. Obviously it can just be typed into the address bar, but I feel it's a good thing to have esp for guests.